Hunt found Ashtanga Yoga, a method of yoga that’s taught in the same way as it is in India, early on in his sobriety. It wasn’t long before he knew that he would devote his life to the practice while spreading the message of hope of recovery. The twelve steps saved his life, and Ashtanga Yoga helped him harness the power of those steps. When he began, his arms were scarred and weak from I.V. drug use. As he continued and deepened his practice, he learned how to hold himself up—physically, but also spiritually and emotionally. As we watch Hunt’s head clear from addiction, the prose improves. Vague descriptions become sharper and more focused, just as the narrator does. This makes the recovery portion of the story more interesting than the downward spiral, which is an inversion of the typical formula for this type of narrative. This is unique, but it’s an accurate reflection of what happens during the process of recovery. What was blurry becomes clear. In other ways, Hunt’s journey is everything we’ve come to expect from a recovery memoir; it’s gritty, heartbreaking, raw, and ultimately uplifting. Each chapter begins with a vignette, a window into the moment in time that Hunt spends the following pages dissecting. These vignettes are where the writing shines. Thrust into scenes as varied and vivid as a crackhouse, a rehab facility, Hunt’s own yoga shala Ashtanga Yoga Columbus, and Mysore, India (the birthplace of modern yoga), the reader gets to peer into the unfiltered reality of Hunt’s life, past and present. A Way From Darkness is available for at: http://www.awayfromdarkness.com/ and will be available on Amazon.com in March. 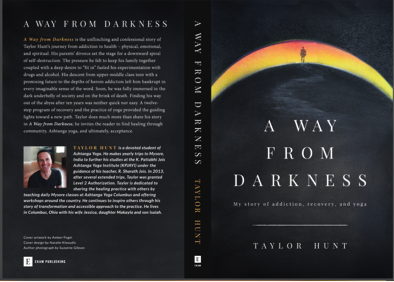 This entry was posted in Ashtanga Vinyasa Yoga and tagged A Way From Darkness, Ashtanga yoga, recovery memoir, taylor hunt by Emma. Bookmark the permalink. Sounds a very interesting book. Will have to check it out.